The SAAB MFI-15 Safari, also known as the Saab MFI-17 Supporter, is a two/three-seat propeller-powered braced shoulder-wing basic trainer aircraft. The aircraft has forward-swept wings and a fixed tricycle landing gear, a tail-wheel landing gear is optionally available. The aircraft was a new design developed at Malmö Flygindustri based on the basic design Malmö-Flygindustri MFI-9 Junior, best known of the German built derivate the Bölkow Bo 208. On 11 July 1969, SAAB flew the prototype (SE-301) of the SAAB-MFI 15, powered by a 119 kW Avco Lycoming IO-320-B2 flat-four engine and with a conventional low-set tailplane. The latter was later modified to a T-tail configuration to minimise damage when operating from rough airfields. On 26 February 1971 the prototype was flown with the more powerful Avco Lycoming IO-360-A1B6 air-cooled flat-4 piston engine, which became the standard powerplant for the production version, now designated as the Saab Safari. A military version designated originally Saab-MFI 17 was flown on 6 July 1972 and differed from the Safari by being equipped more specifically for use as a military trainer, or for artillery observation or forward air control and liaison. A trainer based on the Safari's design was built in kit form for assembly in Pakistan as the Mushshak, with 92 aircraft delivered to the Pakistani Air Force. A later batch of 120 aircraft was license-built in Pakistan as MFI-17 Mushshak and MFI-395 Super Mushshak. On 10 January 1975, the Danish Department of Defefence signed a contract for the delivery of thirty two MFI T-17s. The T-17 aircraft is basically an MFI-15-200A with a new strengthened wing, including hard points for weapons and internal fuel tanks. They were built at Malmö Flygindustri (a part of SAAB). The designation T-17 originates from the factory’s unofficial designation for this updated airframe, MFI-17 "Safari". 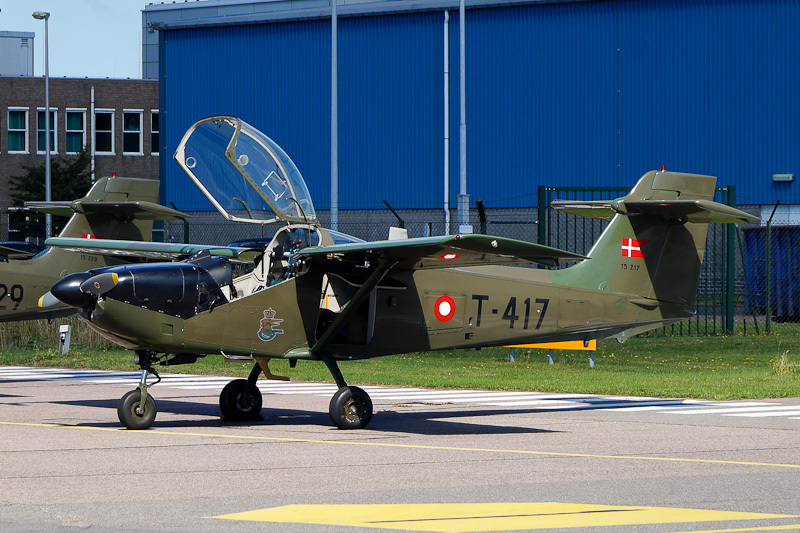 Next to the aircraft delivered to Denmark and the Pakistani, the MFI-15 / MFI-17 was used as civil aircraft and as basic trainer aircraft by several air forces. When the production ended in 1979 a total of 462 aircraft of the Safari were produced: including the 212 Pakistani CKD and 250 fully assembled aircraft built by Saab. On 10 January 1975, the Danish Department of Defefence signed a contract for the delivery of thirty two T-17s as replacement fothe aging KZVII; Chipmunk and L-18C Super Cub in service with Kongelige Danske Flyvevåbnet (Royal Danish Air Force) and Haerens Flyvetjaeneste (Danish Army Air Service). On 28 August 1975, the first MFI T-7 (c/n 15-201) of the 32 T-17s destined for Denmark was flown first as SE-M15. On 4 September 1975, this aircraft was delivered to the Danish Air Force as T-401. Op 21 October 1976, MFI T-7 c/n 15-217 was delivered to the Royal Danish Air Force as T-417. Twenty three of the MFI T-7s entered service with the Air Force and nine with the Army Air Service. On 30 August 2016, the Royal Danish Air Force T-417 was one of three MFI T-7 Supporters visiting Den Helder Airport in the Netherlands.